If you've stuck your head outside this past week you really needed to make sure your hairpiece was glued down tight. Steady 15 knot winds that gusted to over 25 knots were the norm since Monday. Toss in some lunchtime rain showers and this was a really tough week on the water. So what do you do when you're guiding fly anglers in conditions like this? It's simple, you find somewhere to hide. There are countless narrow shorelines and coves around Pine Island where you can tuck your boat out of the wind and still work a fly rod. And fortunately, some of these tight spots can hold lots of resident tarpon. No, they're not going to be the IGFA world record fish that are migrating up the Gulf beaches right now. Far from it. Most will be more like the little 2 pounder that DC angler Jim McCleskey caught with me this morning. Right now, any tarpon is a good tarpon, so I'm counting this one in the success column. Here's a hint for those of you looking for fish like this on your own. These little tarpon like deeper water along the shorelines and they're most active just after sunrise and before sunset. If you do find a rolling school, go easy on them. Hook one or two and then leave them alone for the day. Beat them up too much and they'll vanish from that spot for a long time. 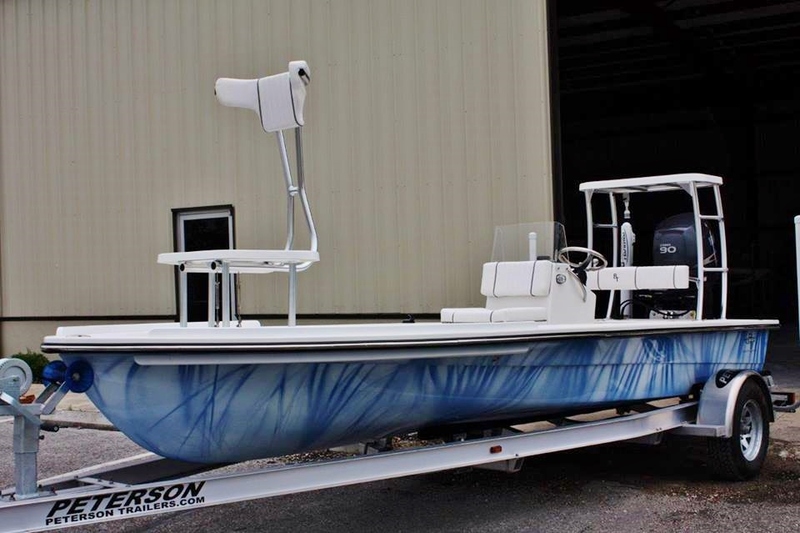 This is one of the coolest looking skiffs to come out of the Beavertail shop this year and it's going to the excellent bonefish flats of Crooked Island and Capt. Shaky McKinney. The water camo paint job on this boat looks even better in person. I haven't been over the Bahamas in a long time but I'm tempted to book a post-tarpon season trip over there just so I can fish with Shaky on his new BT3. If you want to learn the art of casting a fly to our local inshore fish, Joe Mahler is the guy to contact. This is a shot from yesterday when we finally landed two decent snook after a windy morning chasing tarpon that didn't want to bite. There are a lot of them out there. Just look for the mullet. Boston angler John Foster joined the Tarpon On Fly Club this afternoon with this half-pound beast caught just south of Matlacha. I know that some of you are saying, "What a pathetic little fish." Well, did you catch a tarpon on fly today? No? Then shut up. This is one of the most popular first generation Beavertails and only a couple dozen were built. They don't come up for sale often and the owner of this skiff did some excellent work restoring this boat to like-new condition. At only $15,800, this is a steal for a used Beavertail. 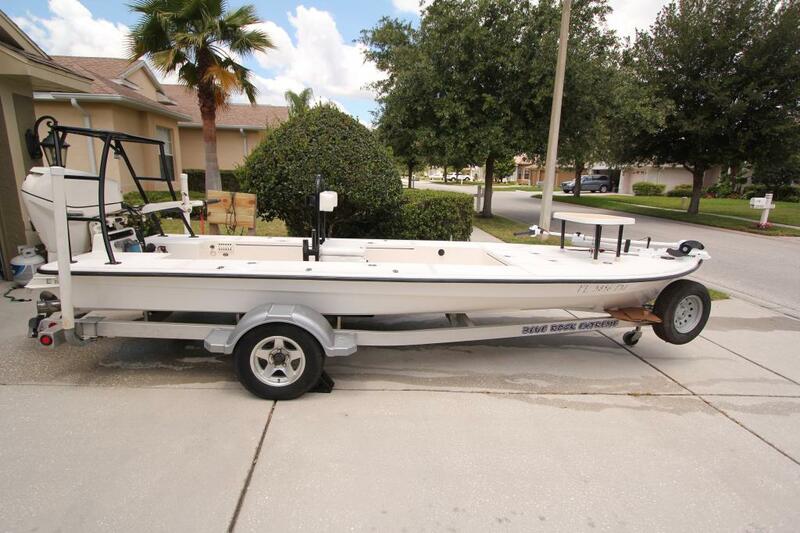 Below are some photos and details from his posting on Florida Sportsman's forum. This skiff has been professionally rehab'd by Glasser Boat Works (Jonathan Glasser). His craftsmanship and attention to detail is amazing and he made this skiff better than brand new. I had a tarpon trip booked with MN anglers Brian and Nathan Anderson on Sunday moring but a solid overcast put those plans on hold for a while. Sightcasting to those fish requires lots of blue sky and we had an excellent rising tide at the same time, I shot up into Buzzard's Bay in the north part of Matlacha Pass and put the guys on a bunch of tailing reds for a couple hours. Nathan landed this really nice 22 incher on a Dupree Spoon fly just before the water flooded in and covered them up for the morning. Redfish are everywhere right now and just like any other time of year, they'll be following the mullet. Look for the food and you'll find the predators. A really cool sight from today was a huge school of cownose rays just off the Burnt Store Bar in Charlotte Harbor. There were easily over a thousand of them swirling around in what was probably a spawning ritual. These mid-size rays are common down here but this was the first time I'd seen them doing something like this. Neat stuff out there right now. 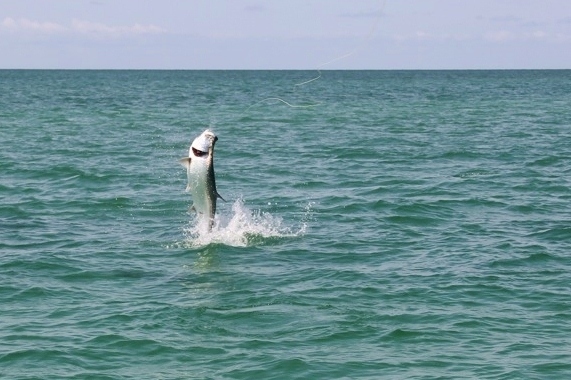 I finally got a decent shot of a jumping tarpon late yesterday afternoon. This fish ate a lime green Toad fly and then launched itself into some stunning aerobatics worthy of the Blue Angels. Unfortunately we didn't land this tarpon and if you look closely at the photo you can actually see the fly popping right out of it's mouth. It was a simple case of the angler, (who shall remain nameless since he's a long time client, good friend, and total idiot) forgetting to bow to the king. It can happen to the best of us, even a highly experienced sales rep for a huge New England based tackle company who's caught dozens of tarpon over the years and really should know better. Better luck next year, John Doe. 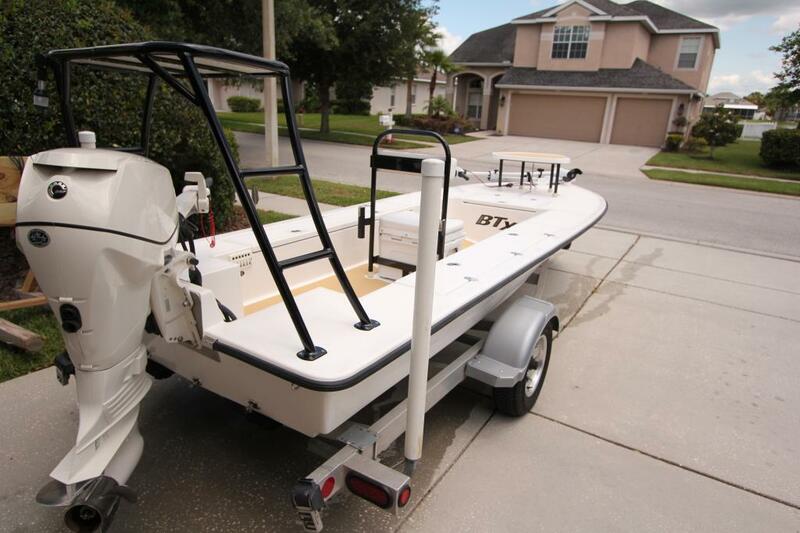 2008 Beavertail BTX For Sale, Tampa, FL. This is one of the most popular first generation Beavertails and only a couple dozen were built. They don't come up for sale often and the owner of this skiff did some excellent work restoring this boat to like-new condition. Below are some photos and details from his posting at Florida Sportsman. Hat tip to Bonefish On The Brain for showing me this absolutely excellent video from Leland Outfitters. I haven't been down to Mexico in a long time and this has me itching to book a trip back there soon. For all you aspiring film makers out there, this is how it's done. When the tarpon don't want to bite you'll throw your flies at anything on the flats. It's an added bonus when those targets turn out to be big cobia. Local angler Dan Pontius scored this 27 incher just south of Burnt Store Marine this morning. He was casting a 2/0 Tarpon Toad at a pack of these fish following a big stingray. Cobia are a common sportfish throughout the Gulf and all the way down to the Keys but this was the first fly caught one on my boat this year. When these fish hang on the backs of rays they'll hit almost anything that moves As an added bonus, cobia are one of the best tasting things that swims. A legal cobia has to be 33 inches at the fork of its tail so the one in this photo went back to grow a bit. Dan just missed landing a much bigger fish a short time later when we found a pod of five cobes following another ray. He made a pefect shot but a dinky 20 incher shot forward and stole the fly from big daddy. There was no grilled cobia for us today but there are plenty of these guys out there right now. A fair trade when the tarpon don't eat. You know that summer is coming when these guys start to show up in the shallows. I took this photo yesterday of a six foot bull shark in less than three feet of water near Cabbage Key. This is just one of the reasons I don't go swimming around here, although stingrays and jellyfish are far more are far more of a threat to people. Even though shark attacks are basically unheard of in this part of Florida, there are some really big animals cruising the flats right now. These fish are great to see while we're on the water and even more fun to catch, but they should all be released unharmed. Winds are calm in the mornings and the temps are crawling back up towards 80 degrees so that's great news. Angler Zach Bruner took advantage of this yesterday and scored a nice inshore slam in Pine Island Sound. While you're waiting for the wind to calm down and the water to warm back up, tie some Tarpon Toads. The rotten west winds that have ruined tarpon fishing for that last three days should be gone soon and the big migratory schools will be moving up the beaches. Stay tuned. Bob Monti completes his Slam. I'm banging my head against the wall right now. After two days the rain finally stopped late Thursday and Friday was beautiful. The fish were a bit lock-jawed but my anglers managed to land a Slam and brought home some nice trout and a red for dinner. Not a bad day and I was looking forward to tarpon fishing this weekend. Unfortunately, the weekend wasn't looking forward to me. The wind cranked itself up to a wonderful 20 knots and was blasting straight out of the west all day. Goodbye tarpon for another day. There are a lot of them out there and my anglers are putting a few in the air, but the cruddy weather has been relentless over the last week. I'm staring out the window at a driving rainstorm right now which caused me to cancel two trips today. That doesn't make me happy but it's nothing unexpected. Tarpon season always seems to start off like this. Bringing a fly rod on my boat at the beginning of May has always been the quickest way to whip up some wind and clouds. On the plus side, the water is very warm right now, well into the lower 80's in Charlotte Harbor. That's bringing a lot of big fish into the shallows. The migratory schools are already pouring through the Keys and they should make their way up here in another couple of weeks. Mid-May is when I start concentrating on the Gulf beaches for these tarpon. Maybe by then it will stop raining.